Weddings & Special Occassions at Stradey Park Hotel01554 758171work Wedding Ceremony VenueStradey Park Hotel has earned an enviable reputation as being one of the finest wedding venues in South Wales. We know that each bride is unique, and that’s why you will have your very own personal wedding coordinator from your first show around until your wedding finishes to ensure your wedding is exactly the way you want it. From the romance of colour changing chandeliers, tempting wedding breakfast menus, red carpet on arrival, state-of-the-art sound system to the choice of linen colour. 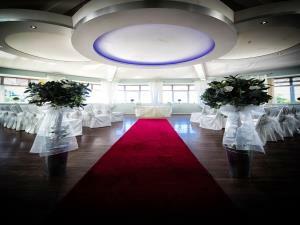 With a range of venues capable of holding between 20 - 200 guests for registered civil wedding ceremonies & civil partnerships, Stradey Park Hotel is the perfect venue for your formal ceremony and your celebration afterwards.